I went to Carmel this week for a master class by George Young. The week started off with a concert on Monday night. George played classical music for the first set and then jazz for the second. Talking about his piece “For Diz” written for Dizzy Gillespie and somewhat based on ‘A Night in Tunisia’ he said that Dizzy Gillespie was in the audience one night when he played it and then came up to him after the show. Dizzy gave George a hug and a kiss on the cheek and called him a “greasy *&$# $*&@.” He didn’t understand this for a long time, but then was told many years later that it really was a great compliment. 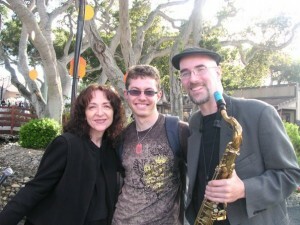 Throughout the week I learned tons of things about the saxophone and playing music. Heard some more great stories too. Maceo Parker – alto sax; Fred Wesley – trombone; Pee Wee Ellis – tenor sax; Rudolph Isley – guitar; Will Boulware – organ; Carroll Dashiell – Bass; and brother Melvin Parker on drums. A saxophone quartet generally is made up of a soprano saxophone, an alto saxophone, a tenor saxophone, and a baritone saxophone. It can also have two altos, one tenor, and a baritone. Occasionally they will use bass saxophones or other varieties even. Arrangements have been written for many jazz pieces and classical pieces. 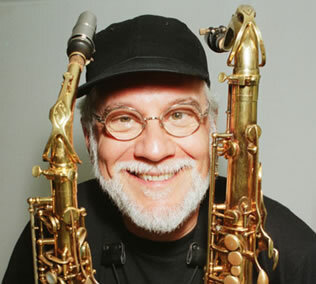 Here are two videos of saxophone quartets. Saxophones are mostly made out of brass, but they can be plated with other metals, painted, or lacquered. Almost all saxophones have a clear lacquer on the surface. A black saxophone gets its color from black nickel plating or paint. Silver is another metal used to plate saxophones. The metal, black nickel or silver usually (occasionally gold), actually changes the tone of the horn and can give it a bit different characteristic. Flute can be made with a high percentage of silver- and that is usually desirable. On saxophones, silver gives a “brighter” sound while black nickel produces a “darker” sound. Maceo Parker plays a gold plated Selmer Mark VI alto. Probably mostly for visual effect. My Keilwerth tenor (in photo) is plated with black nickel. Overall I like the sound of the horn. However, the plating is not the biggest factor in how you will sound. The mouthpiece, reed, and ligature among other things are much more important. When saxophones are painted however, it does not help the sound. There are no acoustic benefits to putting paint on top of the metal. 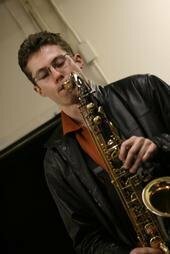 In fact, many saxophone players think it “deadens” the sound. Basically, the paint is for effect and can only hurt your sound. Some players go as far as saying the clear lacquer on most saxophones hurts the sound as well and that as it peels off over time the sound actually improves. Selmer has even made a line of saxophones which do not have the clear lacquer at all. The craziest material I heard of for an instrument is the a solid platinum flute. William Kincaid played one, which he bought at auction for $187,000. His critics say that he needs an $187,000 flute to sound good…. but it seems to work for him and apparently he can afford it. Back in 1997, when “The X Files” was still on the air, a friend of mine who called himself Captain T put out a record called US Aliens that was all about conspiracy theories, Area 51, alien cover-ups, and the Incredible Hulk. It was intentionally funny, but he would stay in character and play it straight : a guy who was trying to tell the world, through music, about the aliens and conspiracies. So – we bought 500 black envelopes, 500 sheets of brown oatmeal paper, 500 alien head stickers, and the best part : 500 huge stickers that said “CONFIDENTIAL MAIL – DO NOT OPEN FOR ANY REASON”. We took each letter out to the backyard and literally rubbed it in dirt, crumpled it into a little tiny ball, then flattened it out a little bit, put the CD inside, sealed it into a black envelope, put the alien head sticker on it, covered it with the huge sticker that said “CONFIDENTIAL MAIL – DO NOT OPEN FOR ANY REASON”, and mailed them out to each station. I joined the website hearandplay.com yesterday, it has a crazy amount of stuff and a huge membership. It will be one of my models for updating Sax Station. If you play piano or music in general, you might want to check it out. Tenor saxophone sheet music is in the key of Bb. It’s a whole step away from concert key, so if you get music that is in concert, you need to play every note up a whole step. It’s more convenient to have music in your own key though! I made SaxStation.com today. That will be my site devoted to music. At combo we’ve been playing Chick Corea’s Spain. It’s a cool tune. I had played it last year too, so I knew it a little better this time around. A good version of the melody is in the real book volume II, but the old real book has the intro to the song. Besides that one we’re playing ‘Someday My Prince Will Come,” Ladybird, and Sugar. I was listening to Miles Davis on “Bye Bye Blackbird” he has a cool intro.